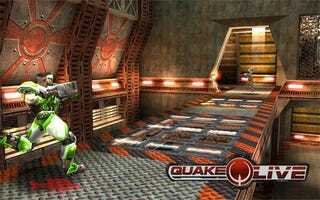 Chomping at the bit to play the Quake Live beta? Well, chomp no more, as "the most exciting and energetic multiplayer game on the internet" has gone public, giving Quake aficionados free beta access. The browser-based Quake Live is now accepting fans of fragging delighted at the sight of free gibs, just as id Software promised. All that one need do is register, download the browser plug-in and enjoy. It's a perfect way to shirk at your day job or, if you don't have a day job, put off gainful employment that much longer. Quake Live looks to be very noob friendly, with helpful tutorials on everything one might need when entering the dangerous waters of online first-person shooters. And you can't beat the price.